Steller or northern sea lions are sometimes confused with California sea lions, but are much larger and lighter in color. Males may grow to 11 feet (3.25 m) in length and weigh almost 2,500 pounds (1120 kg). Females are much smaller and may grow to nine feet (2.9 m) in length and weigh 1,000 pounds (350 kg). Steller sea lions are light tan to reddish brown in color. They have a blunt face and a boxy, bear-like head. Adult males do not have a visible sagittal crest (the bump on the top of their heads) as is seen in adult male California sea lions. Adult male Stellers have a bulky build and a very thick neck with longer fur that resembles a lion's mane, hence the name "sea lion." Steller sea lions are found in coastal waters of the North Pacific Ocean from Japan to central California.. Breeding occurs along the North Pacific Rim from Año Nuevo Island in central California to the Kuril Islands north of Japan, with the greatest concentration of rookeries (breeding grounds) in the Gulf of Alaska and Aleutian Islands. Pups typically are born on islands from mid-May to mid-July and weigh 35-50 pounds (16-23 kg). Mothers stay with pups for one to two weeks before hunting at sea. During the breeding season, mothers spend roughly equal amounts of time hunting and nursing pups on land and gradually spend more time at-sea as nursing pups get older. Pups usually nurse for a year, but some continue to nurse for up to three years. Mating occurs 10-14 days after the pups are born. Dominant mature males maintain territories for one to two months and mate with many females. During the breeding season, males do not eat. Steller sea lions eat a variety of fishes, invertebrates, and occasionally other pinnipeds. Known predators are killer whales (orcas) and white sharks. For management purposes, Steller sea lions inhabiting U.S. waters have been divided into two distinct population segments (DPSs): the Western U.S. and the Eastern U.S at 144o longitude. The differentiation is based primarily on genetic and physical differences, but also on differing population trends in the two regions. The Western DPS declined by 75% between 1976 and 1990, and decreased another 40% between 1991 and 2000 (the average annual decline during this period was 5.4%). Since the 1970s, the most significant drop in numbers occurred in the eastern Aleutian Islands and the western Gulf of Alaska. The extent of this decline led National Marine Fisheries Service (NMFS) to list the Steller sea lion as threatened range-wide under the Endangered Species Act (ESA) in April 1990. In the 1990s, the decline continued in the Western portions of the range leading NMFS to divide the species into two distinct population segments (DPS), Western and Eastern, and list the Western DPS as endangered in 1997. Currently, there are approximately 46,000 individuals in the Western DPS. Recent population surveys suggest that for the past 25-30 years, the Eastern DPS has been growing steadily at about 3% per year, and at certain sites the number of individuals has more than doubled from 1979 to 2002. The current minimum population estimate for the Eastern DPS is approximately 52,000 individuals.. In October 2013, NMFS, under the authority of the ESA, moved to delist the Eastern DPS of Steller sea lion from the List of Endangered and Threatened Wildlife. NMFS determined that the Eastern DPS has recovered and no longer meets the definition of an endangered or threatened species under the ESA, and is not in danger of extinction or likely to become so within the foreseeable future throughout all or significant portion of its range. Unlike the Eastern DPS, the recovery and de-listing criteria for the Western DPS have not been met, and as of October 2013, the Western DPS remains listed as “endangered” under the ESA. The Marine Mammal Center has not rescued many Steller sea lions because they are not common along our rescue range and haul out in remote areas. Most of the Steller sea lions we have rescued have been orphaned pups. Artemis was a Steller sea lion that was rescued as a five to 10 day old abandoned pup from Año Nuevo Island in 1999. After nine months of care, she was released back into the wild and tracked with a satellite tag. Five years after her release, Artemis was sighted on Año Nuevo Island with a pup of her own! Through our extensive experience anesthetizing seals and sea lions for medical procedures at our hospital, our veterinarians are also called upon to do field anesthesia for wild Steller sea lions in Alaska. As a species of concern, our work with each animal can directly contribute to the knowledge of their population. Direct fishing impacts are largely due to fishing gear (drift and set gillnets, longlines, trawls, etc.) that has the potential to entangle, hook, injure, or kill sea lions. They have been seen entangled in fishing equipment with what are considered "serious injuries." Protective zones, catch/harvest limits, various procedures and other measures have been implemented around major haul-outs and rookeries in order to safeguard their critical habitat. Critical habitat has been designated for Steller sea lions as a 20 nautical mile buffer around all major haul-outs and rookeries, as well as associated terrestrial, air, and aquatic zones, and three large offshore foraging areas. National Marine Fisheries Service has also designated no-entry zones around rookeries. NMFS has implemented a complex suite of fishery management measures designed to minimize competition between fishing and the endangered population of Steller sea lions in critical habitat areas. Adopt-a-Seal: Adopt Leo, the most recent Steller sea lion patient at the Center, now back in the ocean. Read the amazing story of Astro The Steller Sea Lion with this charming children's book. 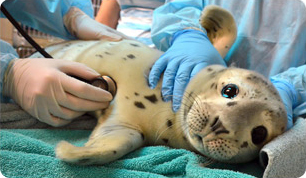 Adopt-a-Seal: Support the Center's work when you symbolically Adopt Astro, the Steller sea lion.